While looking through one of my Grandma’s Scrapbooks tonight I ran across an interesting editorial cartoon by Frank Andrea Miller. 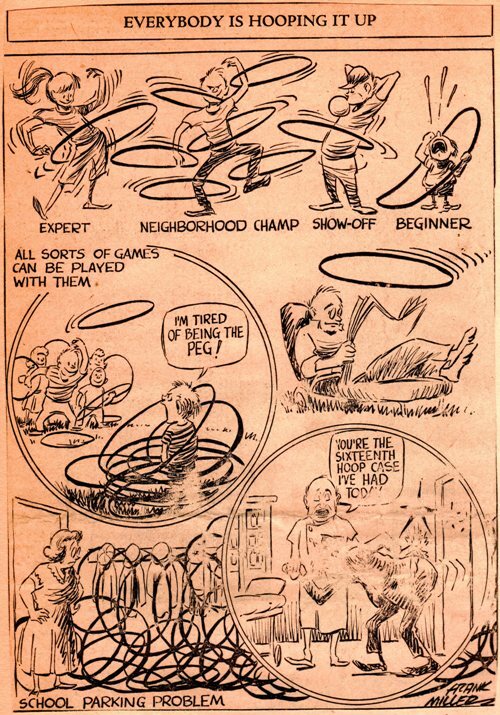 The scrapbook was from 1958 when the Hula Hoop fad first struck. 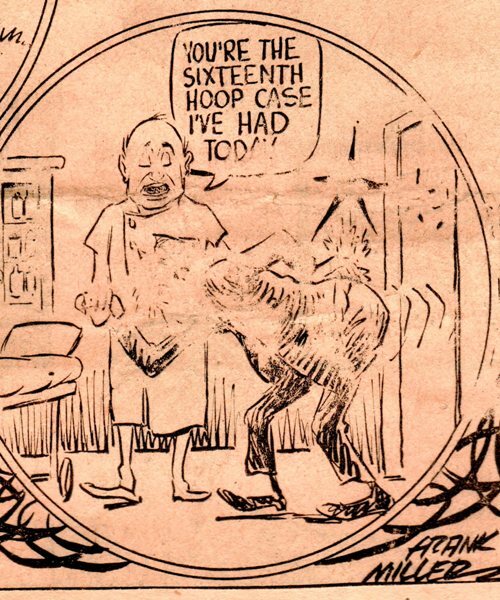 Playing with hoops has been around for a very long time, but the introduction of the plastic Hoola Hoop in 1958 quickly became a fad. 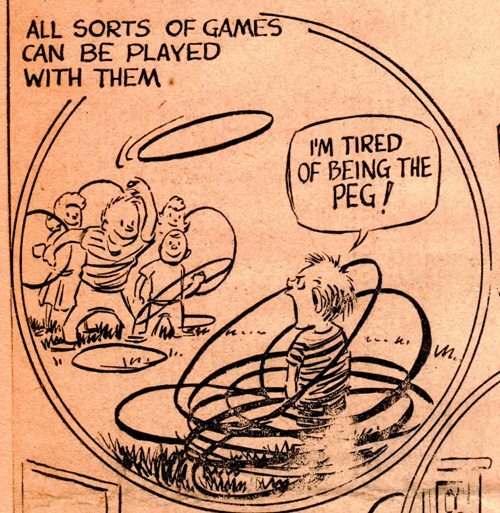 This cartoon was inked during the first months of the Hula Hoop fad which began in the summer of 1958 when 25 million plastic hoops were sold in just four months. Of course, there were many levels of skill shown by people playing with the hoop. The plastic hoop was introduced by Richard Knerr and Arthur Melin who founded the company Wham-O. Wham-O manufactured several iconic toys like the Frisbee, Slip ‘N’ Slide and the Hacky Sack. I remember playing trowing games with the Hula Hoop, but they were usually cooperative and not quite like this. The cartoon is a bit worse for wear as this scrap book has fallen apart and many of the pages have rubbed together. In this case it has rubbed out the details of this person who is having back problems from using a Hula Hoop. A very common injury for someone who has not used certain muscles for quite some time :-). The last time I played with a Hula Hoop was a couple years ago at a company picnic. I was showing some of the younger employees how to use a Hula Hoop as a jump rope. Luckily those motions were not hard on the back. The pictures though were a bit embarrassing. What are your Hula Hoop memories? 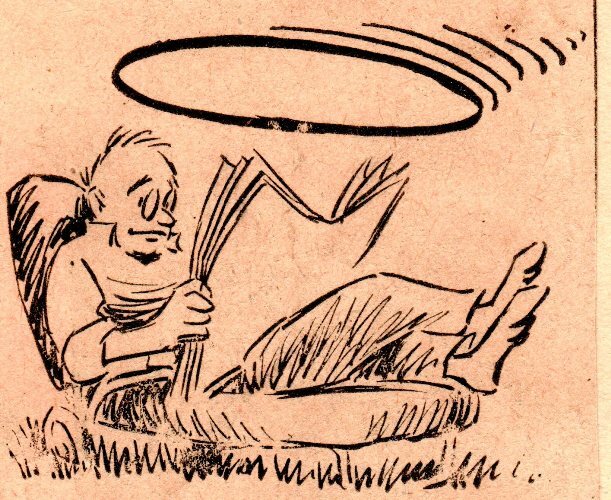 This entry was posted in Culture, Memories and tagged 1950's, editorial cartoon, fads, Frank Andrea Miller, Hula Hoop, Slip 'n' slide, toys, Wham-o. Bookmark the permalink.